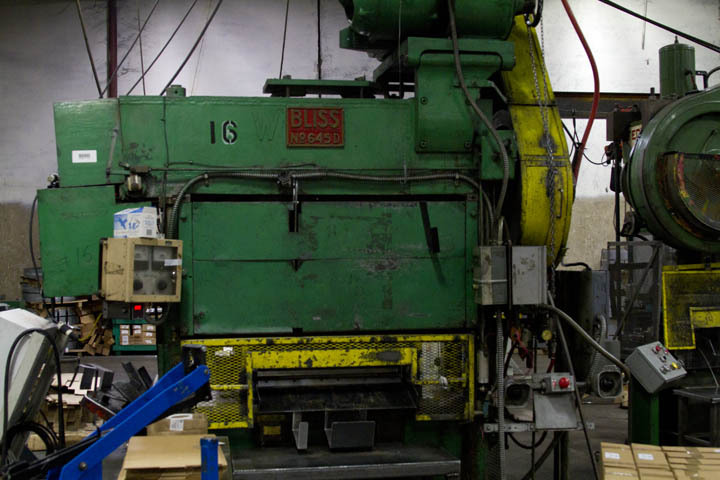 What is a Punch Press? A punch press is a machine that creates a certain amount of pressure, measured in tonnage, to be able to bend, pierce, form, and shear all types of materials. 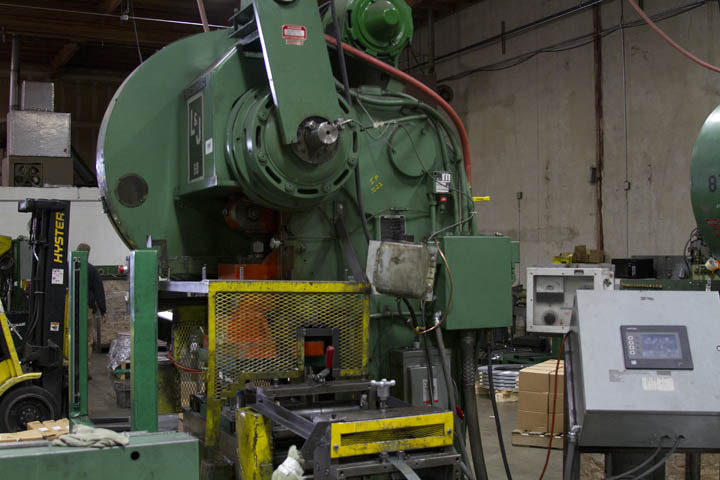 Some punch presses are operated by a hand lever that works with smaller, and lighter materials, while other punch presses are ran with electricity and hydraulics to improve the speed at which they are ran, and the tonnage they can create. Many of the punch presses we use are ran via electricity to power a crankshaft or flywheel to generate the speed and tonnage for the ram to cycle through an operation and create a part. Today we’ll be going over the two main styles of punch presses, as it is important to understand the two main body types of punch presses before we get to their inter-working parts. Here is an example of a C-Frame press. The body of the press wraps around the ram allowing for access to the operating area from three different angles. The C-Frame punch press, also commonly referred to as a Gap-Frame punch press, is characterized by the body of the press wrapping around the area of operations, resulting in the form of a “C” around the bolster plate. C-Frame punch presses main advantages are the three access points to the die, and generally speaking, lower costs as compared to most Straight-Side punch presses. However due to its shape, the motion derived to the ram will always create a slight mis-alignment under load, and the steps to counter-act the mis-alignment can lead to extra costs. Three access points to the operations area, allowing easier die maintenance and adjustments, along with evacuation of scrap metal and finished parts. Generally less expensive than a Straight-Side punch press. Un-avoidable, mis-alignment due to body construction. Added costs and operations to counter act mis-alignment. Here is a front view of a straight-side punch press. There are only two points of access to the die and operating area of the punch press. Straight-Side punch presses look as they are described; straight, with two main sides. While Straight-Side punch presses provide less areas to make adjustments to dies and evacuate scrap metal and finished parts, Straight-Side presses do not have the mis-alignment issues that come with a C-Frame press. This makes them more accurate, and best to use when tight tolerances are required. No issues with mis-alignment, better for high tolerance parts. Less requirement for die maintenance due to accuracy of press. Higher costs of presses, and moving costs due to larger size and weight. Less access points to work area, making adjustments and scrap evacuation more difficult. Next week we’ll take a look at some of the inner working parts of a punch press that allows a stamping operation to produce parts. This entry was posted in Metal Stamping on February 26, 2014 by johnatmetalproducts.